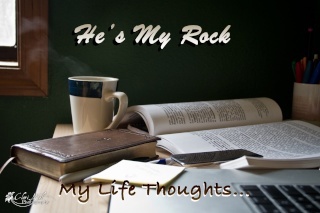 He's My Rock: I failed. It's amazing how easily you can make the same mistake multiple times. It's human nature I guess. This past month or two(give or take) I have failed. A lot. We all fail. We're human. Sinners. But I am oh, so grateful for God's grace, mercy and abundant forgiveness! I have spent weeks trudging through life, sometimes happy, sometimes sad...searching for something. But through it all I was letting myself get distracted from Christ. Just little distractions, but distractions I didn't get rid of. Through a series of events over the past week or so I realized just how much I'd like these distractions become the determining factor or how I felt or acted. But even when you realize you're in the wrong and you've failed, it's still not easy to get rid of the cause. At all. And I fought it for a few days-which put me in a REALLY bad mood. When you don't listen to God's still small voice...sometimes He'll give you something you won't be able to ignore. Usually something you won't enjoy at the time. And that's what happened. I guess you could call it a wake up call. But it's what it took to remember, once again, how I had been letting these little things get in the way of following Christ with EVERY part of me. Don't get distracted. It can be anything. A job, a relationship, a friend, money, parties....if we let anything take priority in our minds above Christ... well... obviously something needs to change. Christ should be our #1 focus. AT ALL TIMES. And those things that are distractions, whether or not they in themselves or bad or not....need to be kicked out the door. We can tell ourselves that they aren't distractions, but that won't solve the problem. Just man up and get rid of them! Often times it will hurt. In fact, I can almost guarantee it will hurt. And you'll be tempted to go back even after you get rid of them. BUT IT'S NOT WORTH IT. Our happiness, our joy, isn't found in the day to day distractions of life. It's found in Christ. It's found in the hope He gave us for eternal life by dying for our sins. It's found in pursuing and serving Christ every moment of the day. And when those distractions come, it's turning away and seeking Christ all the more. I failed. I got distracted.